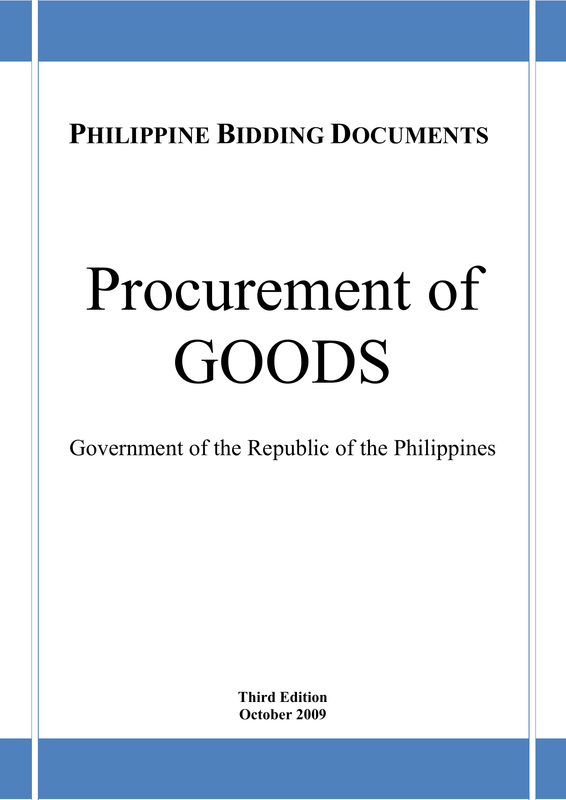 Regulations (IRR) of Republic Act (RA) 9184.
and/or functions of the winning bidder. the PBDs groups the provisions that are intended to be used unchanged in Section II. and provisions specific to each procurement and contract should be included in Section III. 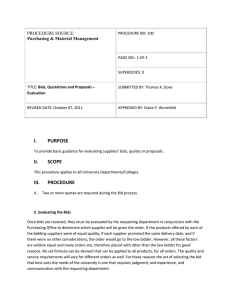 Bid Data Sheet (BDS); Section V. Special Conditions of Contract (SCC); Section VI. are provided in Section VIII. Bidding Forms. circumstances of the particular Project. documents should contain neither blank spaces nor options. government/foreign or international financing institution procurement procedures and guidelines. to Bidders and Section III. General Conditions of Contract, respectively. in particular to the relevant information in the BDS. automatically rejected at bid opening. to payments under the contract for [insert name/no. of contract]. period] from the date of submission and receipt of bids, a contract similar to the Project. Section II. Instructions to Bidders. governing Boards; in the case of (LGUs, the Budget for the contract approved by the respective Sanggunian. other information necessary to enable potential bidders to decide whether or not to respond to the invitation. foreign, subject to the conditions for eligibility provided in the IRR of RA 9184.
International Cooperation Agency, or World Bank)]. Bidding Documents not later than the submission of their bids. open to all interested parties. open only to all interested parties who have purchased the Bidding Documents. stated in ITB Clause 18.
address below. Late bids shall not be accepted. without thereby incurring any liability to the affected bidder or bidders. may not hold a pre-bid conference. 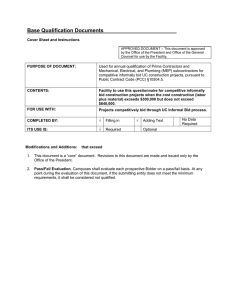 also provides information on bid submission, opening, evaluation, and award of contract. included in Section II which are specific to each procurement. section, but rather under Section IV. General Conditions of Contract, and/or Section V.
contradictions between clauses dealing with the same matter. referred to as the “Goods”). is described in ITB Clause 28.
eligible payments under the contract. benefits of free and open competition. in this Clause for purposes of competing for the contract. mentioned in ITB Clause 3.1(a). as reflected in the GCC Clause 3.
are the subject of the bid. of the said JV, as may be appropriate. Clause will result in the automatic disqualification of a Bidder. least equivalent to a percentage of the ABC stated in the BDS. 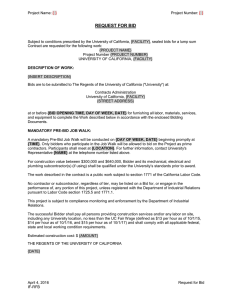 the contract for this Project (CLC). duration of more than two years. Sentral ng Pilipinas (BSP) as authorized to issue such financial instrument. 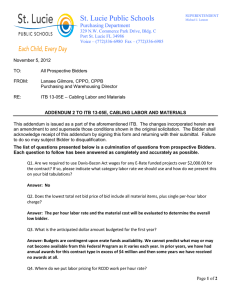 Supplemental/Bid Bulletin(s) as provided under ITB Clause 10.3.
data furnished by the procuring entity. those costs, regardless of the conduct or outcome of the bidding process. Philippines which may affect this Project in any way. office indicated in the Invitation to Bid. under Chapter VII of the Charter of the United Nations, subject to ITB Clause 27.1.
portion of the Goods shall be disallowed. of the technical component of its bid. the technical and financial components of this Project. 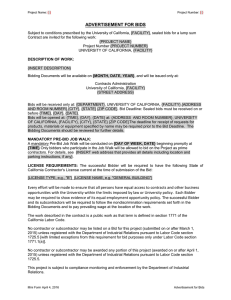 writing as an amendment thereto and issued as a Supplemental/Bid Bulletin. deadline set for the submission and receipt of bids. shall be identified as an amendment. accordance with ITB Clause 23.
translation shall govern for purposes of interpretation of the bid. IRR of RA 9184 and using the form prescribed in Section VIII. Any other document required in the BDS. contained in a single envelope or submitted in two (2) or more separate bid envelopes. countries of origin of the Goods to be supplied under this Project. indicated, the same shall be considered as non-responsive, but specifying a "0"
(INCOTERMS) published by the International Chamber of Commerce, Paris. obtain insurance services from any eligible source country. pursuant to ITB Clause 24.
prices shall be quoted in Philippine Pesos. Pesos at the foregoing exchange rates. shall not be required or permitted to modify its bid. authorized to issue such security. period indicated in ITB Clause 18.2.
security validity period as indicated in the ITB Clause 18.2.
any other reason stated in the BDS. financial component of the bid. spaces shall be filled in with the information requested. discrepancy between the original and the copies, the original shall prevail. signed or initialed by the duly authorized representative/s of the Bidder. the opening of bids, in accordance with ITB Clause 21.
no responsibility for the misplacement or premature opening of the bid. the date and time indicated in the BDS. not be accepted by the Procuring Entity. deadline shall not be considered and shall be returned to the Bidder unopened. prescribed for submission and receipt of bids. directly or indirectly, for the same contract. “failed”. Otherwise, the BAC shall rate the said first bid envelope as “passed”. enumerated in ITB Clause 12.1(a), items (i) to (v). joint venture partners constitutes compliance. sheet. The BAC members shall sign the abstract of bids as read. the case of ITB Clause 26.
award will result in the rejection of the Bidder’s bid. Procuring Entity shall not be considered. lowest bid offered by a Domestic Entity. non-Philippine national shall be increased by fifteen percent (15%). amount of the lowest Foreign Bid or the bid offered by a nonPhilippine national, as the case may be. requirements under these Bidding Documents. Invitation to Bid for this Project. pursuant to ITB Clause 24, in order to determine the Lowest Calculated Bid. calculated in monetary terms to determine the calculated prices. discounts and other modifications, to identify the Lowest Calculated Bid. bids shall only be based on the bid price quoted in the Financial Bid Form. be the basis for bid evaluation and comparison. Clauses 5, 12, and 13.
and appropriate, using a non-discretionary “pass/fail” criterion. calculated bid price, whichever is lower. is determined for contract award. GFIs, the period provided herein shall be fifteen (15) calendar days. reduced through no fault of the Procuring Entity. Bidder whose bid has been determined to be the LCRB. registered mail or electronically to the Procuring Entity. Approval by higher authority, if required. incorporating therein all agreements between the parties. date the contract and return it to the Procuring Entity. the Procuring Entity and in no case later than the signing of the contract. if issued by a foreign bank. shall declare the bidding a failure and conduct a re-bidding with readvertisement. its Notice to Proceed to the Bidder. the effective date of the contract, unless otherwise specified in the BDS. prepared for each specific procurement. by the circumstances of the specific procurement, must also be incorporated. approved by the respective Sanggunian. Loan/Credit/Grant No.] in the amount of [insert amount of funds]. Select one, delete the other. If the Funding Source is GOP, state here: No further instructions. not participate in this Project. equivalent to at least fifty percent (50%) of the ABC. equivalent to at least twenty-five percent (25%) of the ABC. half of the percentage of the ABC as required above. instructions” or explain the applicable eligibility criterion. similar contracts or state “No further instructions”]. Select one, delete the rest. Schedules, in accordance with ITB Clauses 15.1 and 15.4.
the outright rejection and disqualification of bids. therefor; otherwise, state “Not applicable”. [State date and time] at [State address of venue]. calendar days before the deadline for the submission and receipt of bids. If the Funding Source is the GOP: No further instructions. with a financial component exceeding this amount shall not be accepted. If the Funding Source is the GOP or WB: Bid Prices shall be fixed. provision of GCC Clause 9.
financing institution: Payment shall be made in [insert currency]. Bids will be valid until [insert date]. form with respect to total amount of security. following amount [insert 2.5% of the ABC]. The bid security shall be valid until [insert date]. stage of the public bidding. of the request for clarification. influence the outcome of the bidding in his favor. venture after the bid is declared as successful. within a year, except for valid reasons. instructions” or state additional grounds for forfeiture of bid security. state here: No further instructions. two or more potential JV partners. required number] copies of the first and second components of its bid. The address for submission of bids is [insert address]. The deadline for submission of bids is [insert time and date]. The place of bid opening is [insert address]. The date and time of bid opening is [insert time and date]. applicable to national/local competitive bidding. preference, as the case may be. separately and recommended for contract award separately. will be awarded to one Bidder to form one complete contract. shall be evaluated and awarded as separate contracts. sub-lots for the purpose of bidding, evaluation, and contract award. Grouping and Evaluation of Lots mentioned above and delete the rest. instructions” or, insert applicable provisions. State whether bid modification is allowed or not. on this criterion may be deleted if not applicable. shall be given to early delivery. offering delivery beyond this range will be treated as non-responsive. deliveries later than the earliest delivery period specified in Section VI. from the specified delivery schedule. each Bid, will be added to the Bid price. prices submitted by the Bidder and added to the Bid price. costs shall be added to the Bid price for evaluation. [insert number of years] immediately preceding the date of Bid opening. six months preceding the date of bid submission. required by existing laws and/or the Procuring Entity. 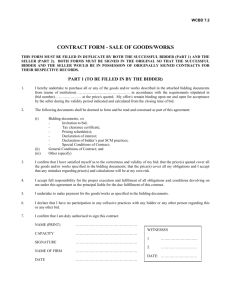 The effective date of the Contract is [insert date]. may be needed, shall be introduced only through the SCC in Section V.
and all documents incorporated by reference therein. “SCC” means the Special Conditions of Contract. as named in the SCC. “The Procuring Entity’s country” is the Philippines. under this Contract and named in the SCC. The “Funding Source” means the organization named in the SCC. Effective Date of the Contract. its recommendation for the issuance of a Notice to Terminate. acts as provided in Republic Act 3019.
be involved with any of the practices mentioned in GCC Clause 2.1(a). auditors appointed by the Funding Source, if so required by the Funding Source. notice’s effective date, whichever is later. Section VI. Schedule of Requirements. as if such items were expressly mentioned herein. requirements for the completion of this Contract shall be provided in the SCC. required qualifications and the approval of the Procuring Entity. in a timely and expeditious manner. responsibilities in accordance with GCC Clause 6.
price adjustment provisions specified in the SCC. obligations stipulated in this Contract. an invoice or claim by the Supplier. made to the Supplier under this Contract shall be in Philippine Pesos. provided in Section VIII. Bidding Forms. the latter has been fully exhausted. any of its obligations under the contract. Entity of the Certificate of Final Acceptance. Other terms specified in the SCC. as far as may be necessary for purposes of such performance. performance under this Contract if so required by the Procuring Entity. mentioned, to the authoritative standards appropriate to the Goods’ country of origin. Such standards shall be the latest issued by the institution concerned. representatives retained for these purposes. Procuring Entity, upon giving a notice pursuant to GCC Clause 5.
specifications required by the Procuring Entity provides otherwise. supplied Goods in the conditions prevailing in the country of final destination. and all the conditions imposed under this Contract have been fully met. Entity in Section VI. Schedule of Requirements. performance, up to a maximum deduction of the percentage specified in the SCC. or difference by mutual consultation. delivery of the Goods under this Contract. procedure specified in the SCC. the result of a force majeure. prevented by the force majeure. The Supplier fails to perform any other obligation under the Contract. Contract to the extent not terminated. performance security and award the same to a qualified Supplier. accrued or will accrue thereafter to the Procuring Entity and/or the Supplier. previously procured by the Supplier. Any other act analogous to the foregoing. special instructions of the Procuring Entity, if any. notice by the Procuring Entity. in part, except with the Procuring Entity’s prior written consent. Contract shall be made except by written amendment signed by the parties. provisions of other parts of this Contract. providing contract-specific information in relation to corresponding clauses in the GCC. Information that complements provisions of Section IV must be incorporated. the circumstances of the specific purchase, must also be incorporated. the provisions of Section IV should be incorporated herein. The Procuring Entity is [insert name of Procuring Entity]. 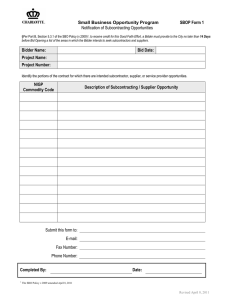 The Supplier is [to be inserted at the time of contract award]. The Project Site is [insert full name and address of the delivery site]. For multiple sites state “The Project sites are defined in Section VI. with the terms specified in Section VI. Schedule of Requirements. Procuring Entity’s representative at the Project Site. the Project Site is [insert name(s)]. Select appropriate requirements and delete the rest. maintenance, and/or repair of the supplied Goods. rates charged to other parties by the Supplier for similar services. specifications of the spare parts, if requested. months of placing the order. facilities at all points in transit. instructions ordered by the Procuring Entity. outer packaging but outside the secondary packaging. their final acceptance by the Procuring Entity. Supplier, and the cost thereof shall be included in the Contract Price. be included in the Contract Price. acceptance at the final destination. design rights arising from use of the Goods or any part thereof. with Section 61 of R.A. 9184 and its IRR-A. adjustment amount payable to the Supplier. range of five (5) to fifteen (15) percent. be one (1) in every application of the formula. Base date = start of the thirteenth month. (representing the mid-point of the period of manufacture). or decrease is more than ____ percent of the Contract Price. delivery dates unless specifically stated in the extension letter. the prices of the Goods and Services subject to adjustment. percent of the Contract Price. Contract Price paid to the Supplier as advance payment. adjustment and the corresponding provisions therefor, if any. Select one and delete the other. provision on Delivery and Documents. necessary prior to payment of contract. The currency(ies) of payment shall be [insert currencies of payment]. Supplier’s warranty obligations in accordance with GCC Clause 1.
applicable inspections and tests, if none, state “None”]. Entity of the delivered Goods. months from the date of shipment, whichever occurs earlier. the unperformed portion for every day of delay. and remedies open to it. appointed in accordance with said Rules. is the date of delivery to the project site. and competitively to the requirements of the Procuring Entity without qualifying their bids. otherwise provided in the Contract. Samples of specifications from previous similar procurements are useful in this respect. should then adapt the General Technical Specifications to the particular procurement. Special Conditions of Contract or the Technical Specifications. equivalence to the standards and codes specified will be acceptable. References to brand names cannot be used when the Funding Source is the GOP. statement of compliance demonstrating how the items comply with the specification. and the format set out in this Section. part of the contract should be modified accordingly. delivery schedule specified in the Schedule of Requirements. amounts, and within the times specified in the Bidding Documents. acceptance thereof and your Notice of Award, shall be binding upon us. We understand that you are not bound to accept the lowest or any Bid you may receive. 5 of the Bidding Documents. 5 If ADB, JBIC and WB funded projects, use IFB. 6 Applicable only if the Funding Source is the ADB, JBIC or WB. Dated this ________________ day of ________________ 20______. 7 If ADB, JBIC and WB funded projects, use IFB. 8 If ADB, JBIC and WB funded projects, use IFB. (hereinafter called “the Contract Price”). respectively assigned to them in the Conditions of Contract referred to. the Entity’s Notification of Award. manner prescribed by the contract. CITY/MUNICIPALITY OF ______ ) S.S.
guarantee in figures and words]. received by the Supplier under the Contract until [date]. 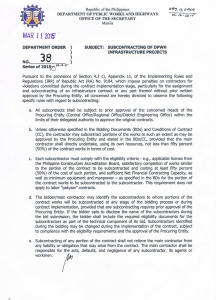 Subcontracting of DPWH Infrastructure Projects.